Our work spaces are very important to all – workers, colleagues, customers and all management of course. Office spaces with some colours will lift the spirits of all staff and make working days more enjoyable. It would be so sad to sit in the office that is dull and soulless. LGC Decorators Ltd can help to transform white and boring spaces to a stunning, pleasant colourful wonder. This is why we think about ourselves as one of the best Office Painters in London. And our clients would tell the same. Don’t know where to start? Uncertain of how to execute a splendid idea? You absolutely require pros – the best Office Painters London can offer. LGC Decorators will turn your dreams into reality with all the staff and any guests, who will want to come back to a pleasant interior again and again. It’s not just the colour, it’s shapes and sizes of furniture, the ceilings and all small interior details that can make a huge difference to the final result. And most importantly – LGC Decorators can help to make this happen. We have completed several office redecorating projects in London working alongside designers and paint or wallpaper manufacturers. 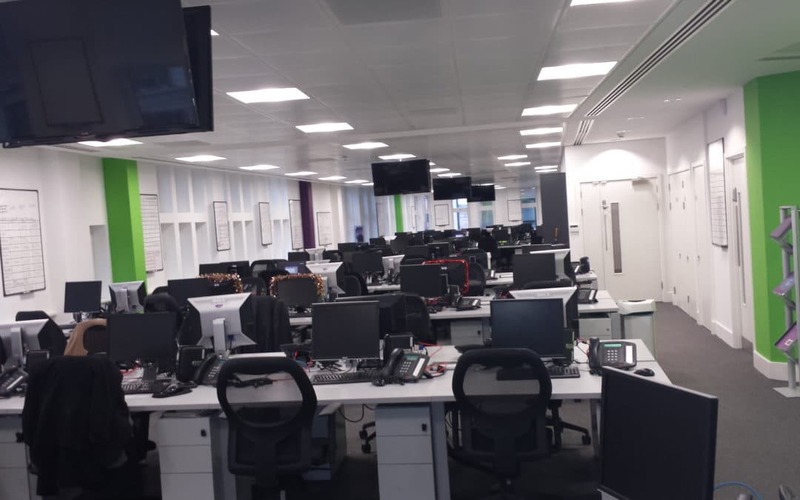 We have carried out office painting in London for companies like Energy UK, Comic Relief, Loyds, Operis, DASSAULT SYSTEMES UK, Conker Group, Rowman & Littlefield, Hydrogen Group and many more. Please speak to us and we will explain how we can transform your work spaces. Why not to test our services, and you will never need to look elsewhere again. Our Office Painters in London have the combination of skills at their disposal, experience, the management of works by our senior staff and quality of materials, which helps us to be one of the best at our trade. If you are looking for Office Painters in London, then look no further. LGC Decorators uses only quality materials, employ experienced workers and has the reputation for completing projects with tight timelines. We work over weekends and bank holidays to accommodate your needs.